You can now play your favorite casino game on the go! The design is done in a way so as to give you a real casino feel. Gameplay and controls are kept simple. Before you leave for Las Vegas, we suggest you practice Video Poker using this app to get your strategy right. 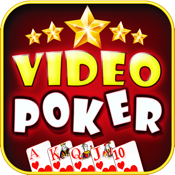 For the users who are new, Video poker is a casino game based on five-card draw poker. After inserting money (or a barcoded paper ticket with credit) into the machine, play begins by placing a bet of one or more credits and pressing the "deal" button. The player is then given cards and has the opportunity to discard one or more of them in exchange for new ones drawn from the same virtual deck. After the draw, the machine pays out if the hand or hands played match one of the winning combinations, which are posted in the pay table. Pay tables allocate the payouts for hands and are based on how rare they are! "Jacks or Better," sometimes simply called "Draw Poker," is the most common variation of video poker. Payoffs begin at a pair of jacks! - 6 Different machines to chose from. - Optimized to run on iPhone 5. - Leaderboard to check your overall standings. - Statistics to record and assess your performance. Go Go Go!!! Start winning!!! Go Video Poker!